Grow Nutrients are well suited for all plants during its growth stages. It gives excellent results as a basic nutrient. It has the proper blend of NPK and trace elements. Use with Micro Nutrients for optimal results. We all know plants need light, water, and food to survive. Food, provided through essential elements, is converted into energy by the process of photosynthesis. These essential elements are broken down into macro and micro nutrients. The macro elements are nitrogen, phosphorus, potassium, calcium, magnesium, and sulfur. The micronutrients are boron, copper, iron, manganese, molybdenum and zinc. The roles of each of these elements are well known and each has essentially one role or function, while some support multiple facets of the plants nutritional needs. ‘Grow’ from X Nutrients supplies these essential macro elements as well as many micronutrients. The remaining micronutrients are provided in X Nutrients ‘Micro’. It is highly recommended that when using Grow that you also use Micro, forming a well balanced diet for your plants. 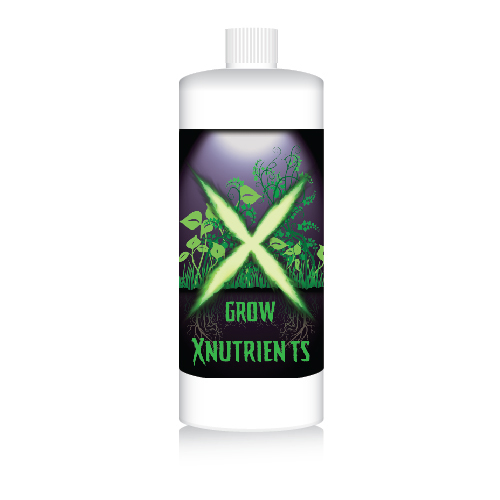 X Nutrients Grow is available in Quarts, Gallons, 2.5 Gallon, 5 gallon, as well as 15 and 55 gallon drums. High Quality Ingredients = Healthier Plants. We use high quality ingredients in our products (Medical and Technical grade). The ingredients sourced to make X Nutrients come from well established and respected companies with strong standards for quality control. Our raw materials are purchased from US companies and our product is made right here in California. There are no fillers, by products, or harsh chemical residues that are often found in lower grade ingredients. When starting with the best just isn’t enough, we take it one step further. Producing a product that beginner and expert gardeners can be successful with every time is one of our pillars; for this reason, our Grow Nutrients are pH buffered to ensure optimum nutrient uptake. Each essential element and micronutrient requires the pH to be in a specific range to be delivered to the plant’s root system for your plant to fully utilize them. The ideal average pH is between 5.5 and 6.5. Simply put; our Grow Nutrients have buffers built into the formula to make sure that the pH stabilizes after you have set it at the desired number for your garden. Grow Nutrients are loaded with micronutrients, including boron, manganese, molybdenum, zinc, and copper. We don’t skimp on our ingredients, including the necessary micronutrients in every bottle. Keeping our system simple and affordable has been the foundation for our business and the reason more customers are getting on X every day. Our two part allows you to deliver the essential elements to your plants effectively and without breaking your budget. Micro Nutrients deliver the remaining elements, calcium and iron. Grow Nutrients are designed for all types of growing mediums, including hydroponics, soil, and coco. When using Grow Nutrients in soil or coco, we recommend feeding every time you water your plants. For hydroponics, we recommend draining and replacing your reservoir every 1-2 weeks depending on the size of your plants and nutrient consumption. If you are new to X Nutrients or considering making a change, you will find comfort in knowing that countless side-by-side comparisons have been performed by ourselves as well as customers and the results speak for themselves. X Nutrients produces just as good a result as every base it has been run against while saving the customer money. Some customers have even claimed results better than two times the competition. With numbers like that and our fairly priced product you can’t go wrong. For more testimonials and customer results you can visit our facebook page at www.facebook.com/hydroponix.